A short-and-sweet post for a short-and-sweet design. Last week I was watching a Youtube video about XYZ Workshop, well known for their 3D printed In Bloom Dress which was printed in 191 separate pieces on desktop machines (which you can actually download and make yourself if you have the time!) In the video I noticed they had their logo on the desk, and for whatever reason, I decided I wanted to 3D print my own similar design. Having already developed a logo in Adobe Illustrator, it was a relatively simple process of exporting a DXF file, bringing it into Solidworks, and “smooshing” (I don’t know if that’s the technical term!) the letters together so that it would print as a single object. A few different extrusion depths and an angled cut on the back, and you have a neat little logo design to smarten up your workspace. This one was printed on an UP Plus 2 in a couple of hours, the detail is great and no support material needed. Have you ever done the Marshmallow Challenge? Chances are you’ve done something similar at school, or if you’ve ever been to a team building workshop it’s a pretty popular creative exercise. Basically teams must build the tallest freestanding structure they can in 18 minutes using 20 sticks of spaghetti, a yard of tape, a yard of string and 1 marshmallow on top. Tom Wujec has been running these challenges for many years and presented a great TED talk if you want to find out more about the challenge and what can be learned from it. Teams were each given an UP Plus 2 3D printer and laptop with Solidworks, and could print as much as they wanted to help build the structure. Now that makes things interesting! These are first year students only new to CAD and 3D printing, so what can they both design and print in such a limited time? Do you print lots of small things, or 1 big thing? How can you tweak the 3D print settings to get things printed as quickly as possible? What do you do when your print doesn’t work? It turns out that this challenge can teach you a lot about 3D printing, and how to rapidly test, prototype and build without wasting any time like in the normal 6 week projects. As you can see from the photos, the results are very impressive! The winning team built a structure up to 249cm, which basically meant they used all the materials end-to-end and could not go much higher even if they had more time. This team 3D printed small little rectangular connectors for the paddlepop sticks, and with a lot of delicate balancing, managed to get their structure stable at the very last second. Much much higher than I expected when I set this challenge! 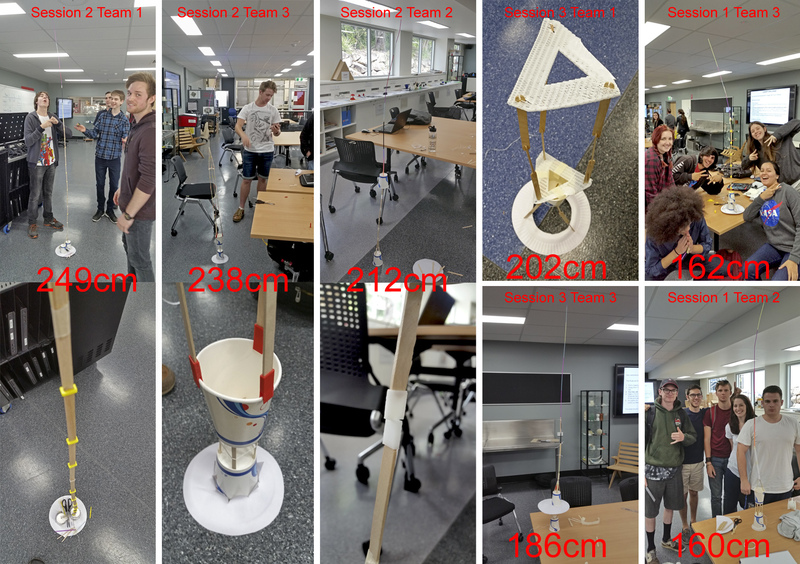 They were in a very close battle with the team that came second for the day, reaching 238cm with a slightly different connection method where they used 3D printing to connect the paddlepop sticks to the cups. What you might notice with the top 3 teams is that 3D printing was used for small connecting elements that could be quickly printed, whereas some of the other teams (eg. 4th place who I only have a photo of part of the structure) were 3D printing much larger bases and simply ran out of time to push their structures quite as high. All of the students were very involved and motivated by this task, it’s something I will run again in future classes and 3D printing workshops as a way to push the limits of the 3D printers and break them out of being so precious about what comes off the printers. It also gets them thinking about how to combine 3D printing with other methods of prototyping, you don’t necessarily need to 3D print every part of your design as it’s quite a slow process, particularly for FDM machines. Feel free to make your own twists on this challenge in the classroom, and I’d love to see your results! Maybe the 3D Printed Marshmallow Challenge will be the next big thing? Yes, a low-poly goat. A few in fact. These are 2 trophies that I’ve 3D printed for my second year class at Griffith University as awards for their current project designing lights for Yellow Goat. Nothing beats getting the students to work on real projects with industry, and adding an extra incentive with these trophies adds an extra competitive level and of course bragging rights for the winners! If you look back to one of the largest 3D printing projects I’ve tacked using desktop machines, the Mario Kart Trophy, you’ll see it’s not the first time I’ve used 3D printing to create a custom trophy. It’s turning out to be a great application of 3D printing since you can get really creative and produce them very cheaply (I wonder if trophy manufacturers are using 3D printing?). On the left is the trophy for the best design as picked by the team from Yellow Goat, and the trophy on the right is for the best team leader, chosen by averaging the marks of all team members and finding which team overall has the highest marks. Trace the outline of the Yellow Goat logo (shown above right) in Adobe Illustrator. Export as a .dxf file, providing accurate 2D line-work to use in the 3D CAD model (you could just bring the image directly into your CAD software if you prefer). Import the .dxf file into Solidworks. Use this line-work to base your 3D modeling off. I also created some guide lines to ensure that my model would fit onto my desktop 3D printer without needing to scale later. Export the final model from Solidworks as a .IGS file. Import the .IGS file into Rhino. The model in the image above on the left is the imported model from Solidworks (yes you could just model the design in Rhino to begin with, however I knew I could get to this point much faster in Solidworks). Use the “Reduce Mesh” tool in Rhino to reduce the number of faces of the mesh. I reduced mine by about 93%, resulting in the low-poly model shown above. It’s also possible to do this type of low-poly conversion using the free software MeshLab, just click here to read one of my previous posts about how to do this. Because 93% is a huge reduction, the resulting mesh did have some gaps where the software didn’t know what to do, so was not watertight (manifold) and ready to 3D print. I manually cleaned up some of the edges and added some surfaces to fix this issue. Export as .stl and 3D print! As you can see I still ended up splitting the large goat piece in order to minimise support material, printing the body piece upside down with the legs in the air and gluing the head back on later. It took a few prints to get the smaller goat right, the middle image above showing some of the messy surfaces I was getting from the Up! Plus 2 printer I used, surprising since it’s normally very good. The ABS seemed a little more sticky than normal as well, meaning the support material didn’t just peel away but had to be scraped and cut, making more of a mess. But third time lucky! I also downloaded the human figure from Thingiverse to again save some time, and it gives the effect I wanted anyway. A bit of chrome spray paint, a chipboard base and voila! Check out the 3D model above for the full effect of the low-poly design!